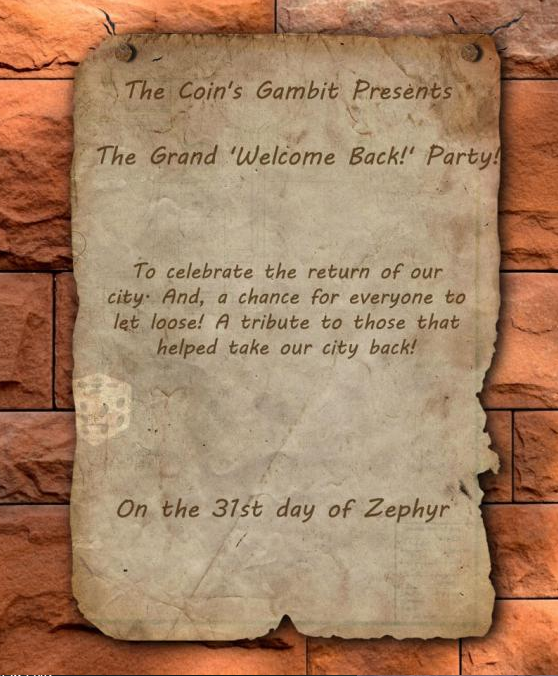 Forums » EU Events » The Coin's Gambit Party! Good Afternoon Ladies and Gents~. Now, we’ve got a little announcement to make. The Merchant Coin and the lovely employees will be venturing over to the Elonian city of Amnoon to provide the locals and all the Outlanders with Krytan-Style events. This will be hosted twice a month, the first event will be starting on January 3rd. And so on, so forth. A perfect chance to get back into Roleplay after the little holiday break. So, without further ado. I would like to present..
To those that are currently within the walls of Amnoon, posters would start appearing around the city..
Now, on a side note. This will be a rather relaxed RP event, a chance for the locals and outlanders to mingle away at their own desire. The events themselves would give a chance for new, and experienced RP’ers to come together and interact. Furthermore, I would like to thank the NOON community for its contribution to the roleplaying community! Cheers for the opportunity! Hey! Just a little reminder that this event is on tonight! See you there. That was quite the successful party! I just want to say a massive THANKS! To all those that showed up. I seriously enjoyed hosting it. A big thank you to my fellow guildies of GANG, and NOON. Yes, it was really difficult to keep up with the text, but.. Rather enjoyable. Keep an eye out for our next event. Thanks once again! Now, continuing on from the event last time, I would like to announce that the next Casino event will be on the 17th of January at 7pm GMT! Just like last time, this is a rather fun community event based within the Casino in Amnoon. 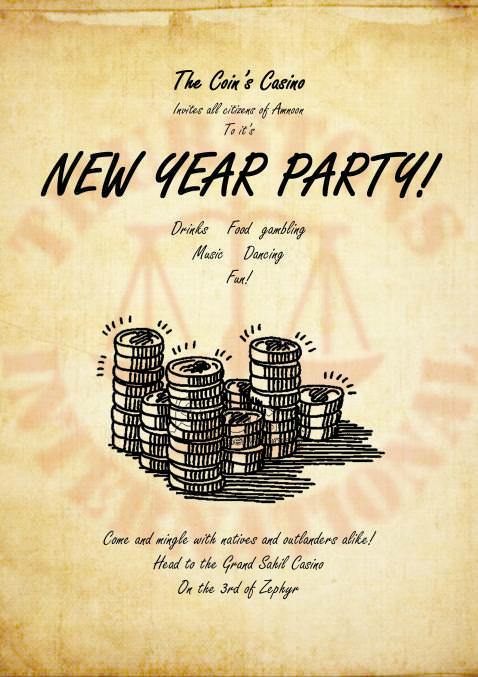 I do hope you'll join us for an evening of drinking, gambling and fun. Once again, thank you for reading! I will be using this thread to keep on posting our events. Hey~! This event will be starting soon. Posters would start appearing upon the walls, and posts of Amnoon. 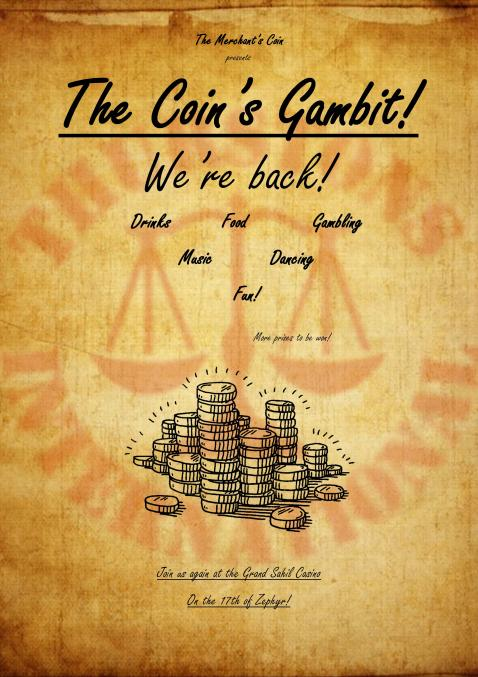 Leaflets are also present within the city, announcing the first party within the Casino after the branded attack. There is certainly an air of excitement about from the locals. Here’s a little announcement to say that the next Casino event -will- be taking place tomorrow at the Grand Sahil Casino. The event is, as ever… Light hearted, and simply a get-together after the wonderful Brandstorm event that followed after the previous one. This will be taking place at 7pm GMT.